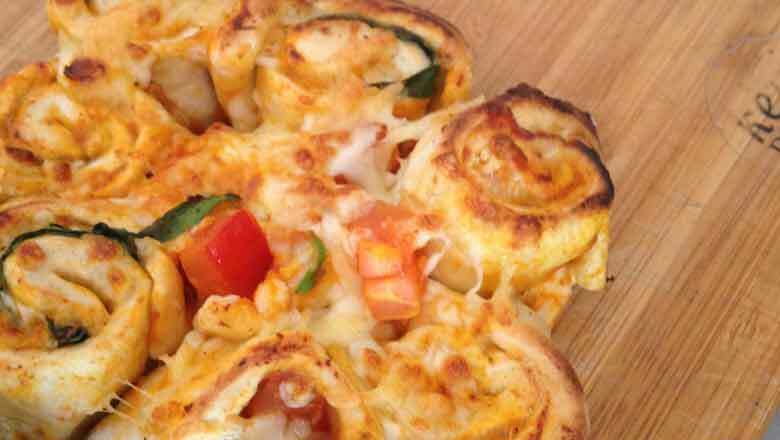 Kids and Adults will love these Pizza Wheels. Preheat the oven to 220˚C/440˚F/Gas Mark 7. Grease and dust with flour a round tray and set aside. Split the pizza dough into 4 and roll each out on a lightly floured surface. Spoon 3 tablespoons of passata on the top of the pastry then add some fresh basil and cheese. Roll each pastry sheet tightly into a scroll and slice the scroll evenly into 6 x 2 cm thick pieces. Place the pieces onto the tray and bake for 6 -12 minutes. Add the strong flour, dried yeast and salt to a large mixing bowl. Mix the dough thoroughly and then move it out onto a floured surface and knead it for 4-5 minutes or until it feels light and springy under your hands. Transfer to a clean bowl and cover well. Leave it to rise for about 30-40 minutes or until the dough has doubled in size.